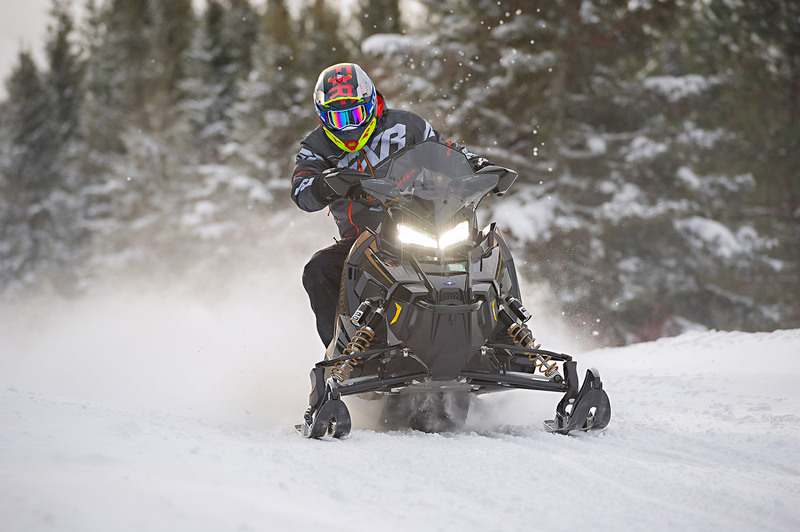 It's no secret, when it comes to on-trail handling, the highly selective and critical crew at Supertrax and SnowTrax Television has made it clear the Polaris Axys chassis with its legendary variable castor IFS is the setup all others must be judged by. Knowing this we wanted to try a set of Split Rail dual carbide skis and evaluate their performance on the new Axys XC Indy 850 with Pro CC shock-in-skid suspension. Our thinking was this: Since the Pro CC skid is double coupled it does display a touch of under steer on initial turn-in which it's stable mate – the Axys Pro-S with uncoupled, external shock rear suspension - does not. For the record, we are undeterred by the Indy XC's slightly softer corner entry response. Why, you ask? Because the Axys chassis in all its variants delivers turn-in which produces no surprises and no unpredictable inside ski-lift. In simple terms the sled feels like a fine quality, kid leather glove in your hands. It cuts, carves and exits corners with precision reserved for exotic wheeled vehicles. Knowing Split Rail's dart-free nature has been consistent in every application we've evaluated them we felt on this front alone, the cost of Split Rails can be justified (well, pretty close to justified). You'll enjoy dart free precision and the confidence it generates on tracked up hard-pack or loose snow. No other ski delivers dart free running like Split Rails. So what about Split Rails on the new Indy XC? Here's the deal. They produce an immediate increase in turn-in which is oh-so-close to the Pro S with Pro-XC uncoupled suspension. There's a lot to be said for the bite of dual carbides – however Split Rail's fully open profile ensures snow being cut by the inner and outer carbides as you turn, does not pile up and lift the ski-bottom off the snow - as is the case with virtually every other dual carbide, closed bottom ski profile. This means there's a positive feel of initial turn-in - powerful enough to rotate the chassis at the corner's apex with virtually no understeer. Is this an improvement for the Indy XC? We think yes and are confident you'll agree. The new Indy XC with closed tunnel, shock-in-skid rear suspension is a winner right out of the box. The addition of Split Rail skis adds an extra measure of control and precision to the industries best handling package.